When it comes to learning more about the history of Westchester County’s “criminal element,” the Westchester County Archives is a good place to start. As the repository for the historical records of the County’s District Attorney’s office, and the Departments of Correction and Public Safety, there is much at the Archives to learn about those who have broken the law and those who have brought them to justice. Whether you are a social historian documenting trends in crime or social relations in the early twentieth century, a student looking for an interesting research topic, or a family historian looking for the family black sheep, the “Crime and Punishment” collections held by the Westchester County Archives are a good place to start. With over 200 cubic feet of District Attorney Case Files and 37 Jail Blotter Books, there are many fascinating stories just waiting to be discovered. The most extensive records in this group are the District Attorney Case Files, 1892-1949 (bulk 1906-1949) (Series 253). These files provide fascinating insights into the functioning of an active prosecutor’s office during the first half of the twentieth century. Although some case files may be razor-thin and contain only a True Bill (indictment) against the defendant, others burst at the seams with extensive case documentation ranging from witness statements, correspondence concerning the case and the defendant(s), and a wide variety of documentation used as trial evidence or to investigate the crime. Some case files even include photographs of the defendants, or, particularly when a murder is involved, the crime scene itself. To view a small sample of the types of records found in these case files see our digital collection "District Attorney Case Files: Obscure, Noteworthy and Notorious". Please note that there are some restrictions on using the District Attorney Case Files collection. First, requests to use this collection must be made in advance and in writing. This can be done either by writing to the Principal Archivist, Westchester County Archives, 2199 Saw Mill River Road, Elmsford, NY 10523, or by e-mail. A statement of the research topic / research interest in the collection must be included in the research request. Second, all Grand Jury Minutes in this collection are permanently closed to the public. Third, access to all records less than 75 years old is restricted. Please contact the Archives for additional information about such requests. From the County’s earliest days, the Sheriff has been responsible for running the County Jail and housing prisoners awaiting trial or pre-sentencing. 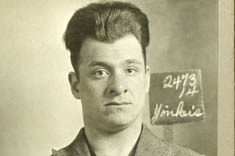 This role was assumed by the Westchester County Department of Correction in 1969, as well as responsibility for the County Penitentiary, which was established in 1916 under the Department of Welfare (now known as the Department of Social Services) for housing sentenced misdemeanants serving sentences of a year or less. The Westchester County Archives holds the Jail Blotter Books (Series 310) maintained by the sheriffs of Westchester County and then the Department of Correction from 1903 through 1973. 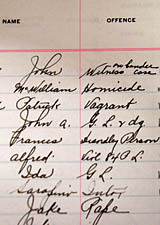 These ledgers provide extensive details about those incarcerated in the jail for crimes ranging from vagrancy to homicide. The information available about each inmate includes the facts about their imprisonment – such as the date they were admitted to the jail, the crime charged with, date of discharge, and number of days confined, as well as demographic information – such as age, gender, race, place of birth, marital status, level of education, religion, and occupation. The latter demographic information makes these Blotter Books valuable resources in studying the make-up of the Westchester jail population over time, while the crime statistics make for an interesting review of the types of crimes being committed over the years. Indexing of the Jail Blotter Books was begun in 2013 from the last year available to researchers (1938) and is being done in reverse chronological order. It is the hope of the Archives to eventually create a full index to the individuals listed in these Blotter Books, particularly for the years 1903-1913, for which there is no other index. For the years 1914-1974 (with some gaps in the 1940s) the Indexes to Jail Blotter Books (Series 311) can be used to look up the complete jail blotter records for individual inmates. Access to Jail Blotter Books and Indexes to Jail Blotter Books that are less than 75 years old is restricted. Searches for individual names can be made in these records but will be done only by Archives’ staff. For additional information about these restrictions, please contact the Archives. Documenting the work of the Department of Correction is not limited to lists of those who were housed within the County Jail. It is also important to understand some of the issues faced by those inmates as well as those who guard them. As part of this effort, the Archives is developing a Department of Correction Historical Records Collection, 1981, 1995 (Series 309) and also has a Department of Correction Scrapbook, 1986-1989 (Series 307). Before criminals are brought to trial or incarcerated for their crimes, it is the police who investigate and arrest the criminals, and even prevent crimes from occurring. The Westchester County Department of Public Safety was created on July 1, 1979, through a merger of the Westchester County Sheriff’s Department and the Westchester County Parkway Police. The Westchester County Archives documents the work of these law enforcement professionals through its “In Memoriam” Collection, 1792, 1925-1985 (Series 285), which memorializes the seventeen Westchester County lawmen who died while on active duty. In addition, the Sheriff Darius Lyon Receipt Book, 1865-1871, 1888 (Series 286) (Westchester County Sheriff from 1865-1868) documents some of the expenses incurred by a County Sheriff in the nineteenth century.